these are all for the same project, a house, designed by me during undergrad at Kentucky. The first (left) is what I thought my parti diagram was. The middle is professor Jose Oubrerie's explanation of what he thought I was talking about, and the last (right) is my reinterpretation of his. As you can see, parti diagrams are not pretty drawings, nor are they sketches that relate to what the project may look like. 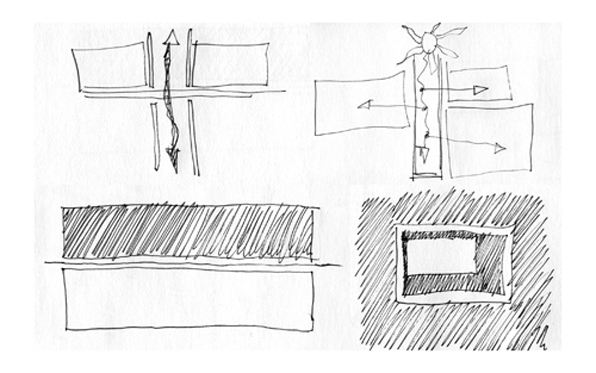 They are idea drawings, graphic representations of the ideas imbedded within the project. If I am remembering correctly (this is 20 years ago or so), my initial thought about the project was to create a building that gathers the landscape into the building. Jose seemed to think that what I was really talking about was a building that projects an interior landscape out to the larger world. The final diagram was my attempt to describe both of those actions as simultaneous activities - centrifugal and centripetal. A parti diagram can describe a purely formal proposition - planar thresholds, cubic volumes - or a programmatic proposition - the position of programmatic elements relative to each other, or the circulation and sequence of spaces. However, I think it exists as a way of formulating an idea into a formal scheme. By "drawing" the idea as a diagram, a formal and/or architectonic disposition begins to suggest itself. In the example above, the arrows flowing in on the first diagram described a house that sat by itself in the landscape and how the making of that house could distill the surrounding landscape into an interior landscape. These arrows moving inward began to suggest a series of screens or thresholds through which that passage would become vital. Not all projects start with this kind of parti diagram, but I think the best either develop them along the way or can be clearly described by a simple series of diagrams. That is not a reductionist process, but rather one that can precisely differentiate the ideas of the project from the forms. Of course, all of this presumes that architecture, and the quest for making it, is in some way as much about ideas and relationships and not just novelty and eye-candy.